In 1982 he got started in dubbing under one of the great masters of the time, during the golden era of this profession for cinema and TV in Spain. He gives voice to a multitude of film characters, although television series have become the focus of his work. His important work as a voice actor captured the attention of the advertising market in 1989.He began his career as an announcer with small roles in radio adverts and TV spots. Over time, he has become one of the leading announcers in Spain, and he is the institutional voice of advertisers and brands with great prestige in the sector. His interest in the gaming world has led him to interpret some of the best-known characters to game console lovers. 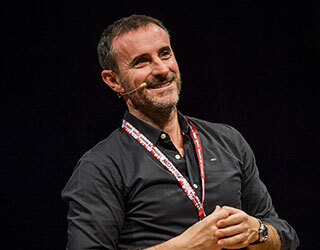 He currently combines his professional activity with teaching, as professor in the Audiovisual, Advertising and Documentary Voice-overs at Rey Juan Carlos University, and he shares his dubbing and voice-over experience in interesting workshops and presentations throughout Spain.